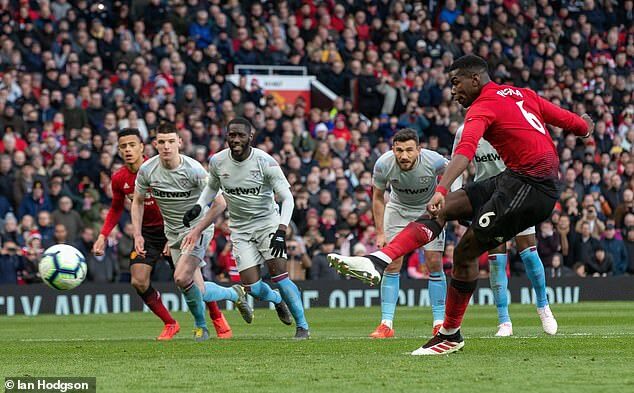 Ole Gunnar Solskjaer has backed Paul Pogba‘s new stripped-down approach to penalties after the Frenchman scored twice from the spot to get Manchester United out of jail to beat West Ham 2-1. Pogba has been criticised this season for stuttering his run-up and had missed three penalties against Burnley, Everton and Southampton, but he made no mistake from 12 yards against Lukasz Fabianski on Saturday. ‘It is up to him how he takes them and I am happy as the ball goes in, but I like that way of running up to the ball and smashing it in,’ said a delighted Solskjaer. ‘The second one was really good, it went right into the corner so the goalkeeper couldn’t get it even though he dived the right way. 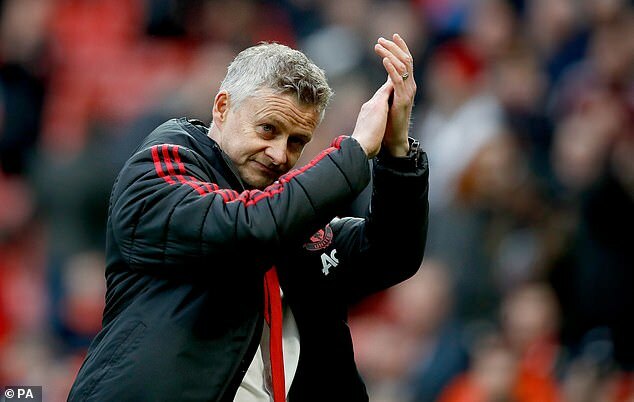 Solskjaer’s side struggled without suspended full-backs Ashley Young and Luke Shaw while Marcus Rashford, Victor Lindelof and Scott McTominay were put on the bench with Tuesday night’s Champions League second leg against Barcelona in mind. The United boss urged Uefa to change their fixture scheduling so both legs of a quarter-final would either be on a Tuesday or a Wednesday. Under current rules, Spurs and Manchester City play their tie on a Tuesday and then the following Wednesday – an eight-day gap – while United and Barca only have six days between their two matches. ‘We tried to google to find out why but if you could find out that’d be great,’ said Solskjaer. The United boss put their sluggish performance down to losing the ball too often. ‘When you have Rashford, McTominay and Shaw out, you lose power and pace. It was a different set up, we had creativity and we tried to make it a different kind of game but kept giving the ball away. It was end to end, like a basketball game. Can Manchester City win a historic quadruple under Pep Guardiola?